Star ratings enable visitors to your website to rate posts, products or services and great scores encourage more people to read them, use them or buy them. Add ratings with these two plugins. 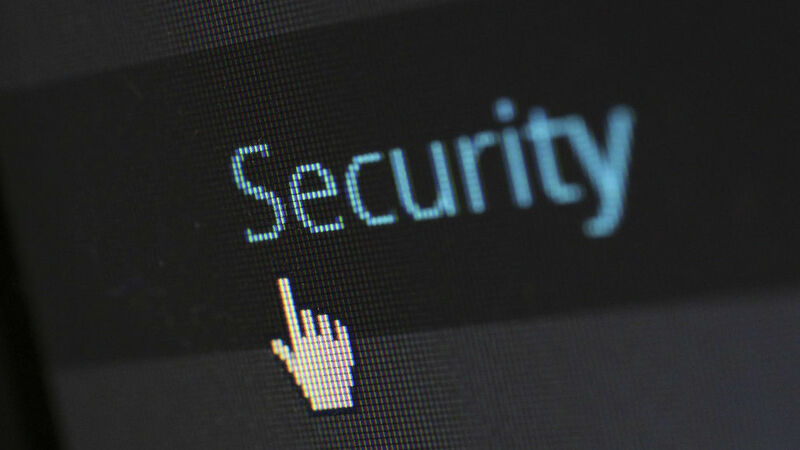 When you see a product or service on the web, whether it is free or paid, you want to know whether it is worth it. The big question is whether it is any good and a visible rating on the page is a major influence on whether you sign up to the service or buy the product being offered. Seeing lots of four and five star reviews from other people that have tried it gives you the confidence to go ahead yourself. It is great for products and services and it is pretty much essential these days to build customer confidence, but it also works for article posts on your blog or website too. People can rate your posts and those with high scores encourage others to read it. 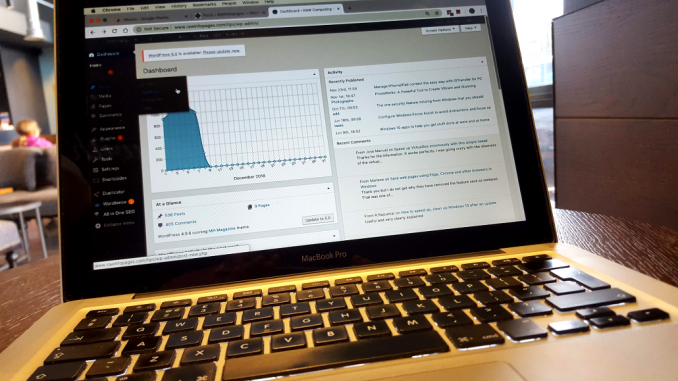 People can rate your posts as a thank-you. How do you add a star rating system to your site? With a plugin of course and there are several to choose from. Here I take a look at a couple of popular free ones and see what they have to offer. WP-PostRatings is a free plugin that enables you to add ratings to any post or page on your WordPress website. If you want to add a rating to every post on your site, you have to be comfortable with editing the PHP files in your theme because you need to insert a function into one or more files at a particular place. That is easy for some people, but it may be something you do not know how to do or want to do. Adding ratings to all posts is awkward and not user-friendly. Fortunately, the ratings can be manually added to a post by typing a shortcode and typing [ ratings ] anywhere in the text displays the ratings widget. 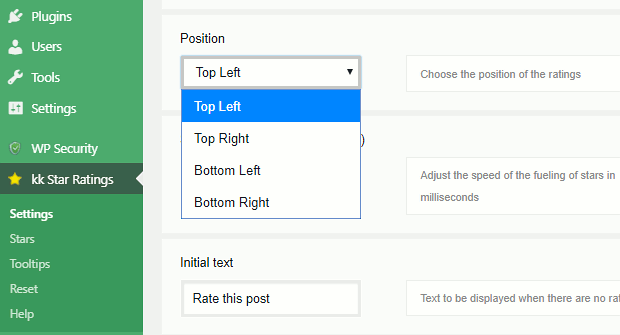 If you are using the block editor in WordPress, insert the Shortcode block and type [ ratings ] into it. It is quick and easy for one post and even adding ratings to a few selected posts requires little effort, but you would not want to manually add ratings to 100+ posts on your site. It would require you to edit every single one and insert the shortcode and if you ever wanted to remove them, you would need to edit every single post again to delete the shortcode. If you have a small number of reviews for example, WP-PostRatings works well and it’s not problem inserting the code. You can also show the rating for one post in another, so if you had a list of products, you could place the rating by each one. 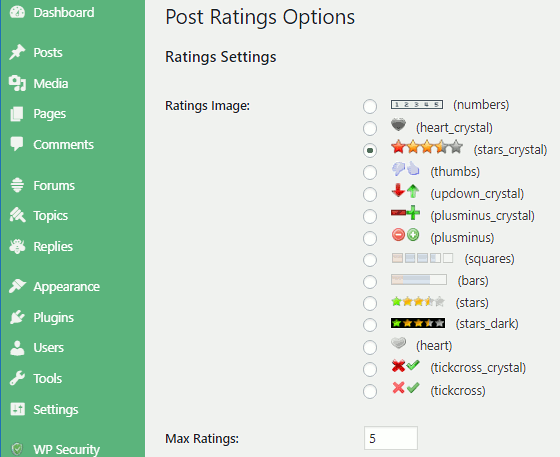 There are 14 types of rating provided in the plugin settings and they include a simple thumbs up/down, tick and cross, to any number of stars, with five as the default. Can voters cheat? You can choose who can vote, such as logged in users or anyone, and whether ratings are logged or not. There are different logging methods and all are designed to stop people cheating with the scores. Without logging, people can vote every time they visit the page or refresh it. They could therefore vote, refresh, vote, refresh all day with 1 or 5 stars and the true rating would be lost. People can vote only once when logging is turned on because it checks if you have voted before, so it is essential for stopping mischievous users. The plugin is easy to use in manual mode and its best feature is the star ratings are shown on the Admin > Posts page. You can see the rating for every post at a glance. 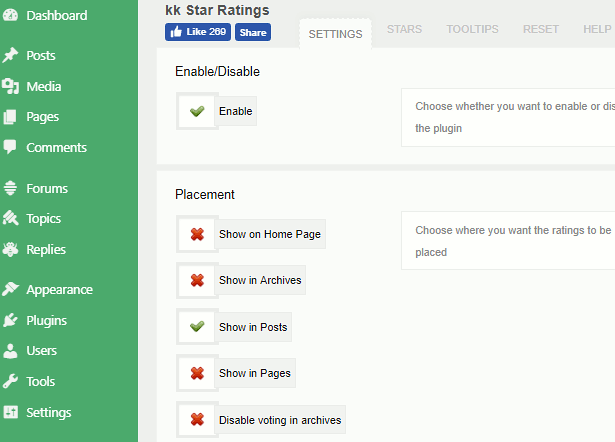 KK Star Ratings is another free WordPress plugin that adds star ratings to your site. It has manual and automatic modes and an excellent range of configuration settings. In the settings is a Placement section and you can choose to show the rating on the home page, posts, pages, and archives. You just tick the ones you want and this makes it very easy to add ratings to every post or page on your site with no need to edit them. Ratings can be turned on or off with a mouse click. You might not want ratings on every post, so there is a very useful option to exclude post categories. For example, you could exclude all categories except reviews. You would then have ratings alongside reviews, but nowhere else. Another great feature is the placement setting and you can choose to show the ratings at the top left, top right, bottom left or bottom right of a post, with text wrap or on a line of its own. Star ratings can also be added manually using the shortcode [ kkstarratings ] and this enables you to place it anywhere you want in an article. The choice of putting it on all posts automatically or manually adding it only to the posts you want is its best feature. Types of rating: Only stars are provided, but you can choose the number and the size, making them bigger or smaller as you prefer. The stars can be replaced with your own images if you want to draw your own or use clip art. Tooltips, text that appears when the mouse hovers over a star, can be defined in the settings, which is useful. Can you cheat? In the default configuration it lets you click the rating as many times as you want. You can sit there all day clicking 1 or 5 stars. In the setting is a Unique voting option that limits voting by recording the IP address. This is essential. 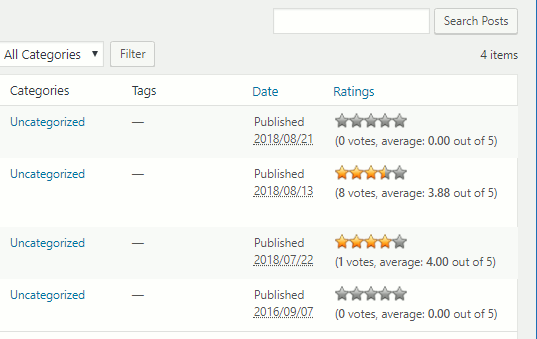 Ratings are shown on the Admin > Posts list so you can check the ratings. It is plain text, which isn’t as nice as an actual stars display, but it is OK. There are many more star ratings plugins available for WordPress and here I looked at only two. However, they are among the most popular. WP-PostRatings is good if you want to manually add ratings to a small number of posts or if you want to select from many different types of rating. It is not good for adding ratings to a lot of posts. The simple customisation and settings for KK Star ratings make this plugin the winner. You can turn on ratings for all posts or all pages, exclude certain post categories, automatically position it top or bottom, left or right on the post, and so on. It is easy to set up and easy to use.